The McTygue girls from Eddyville Nebraska! 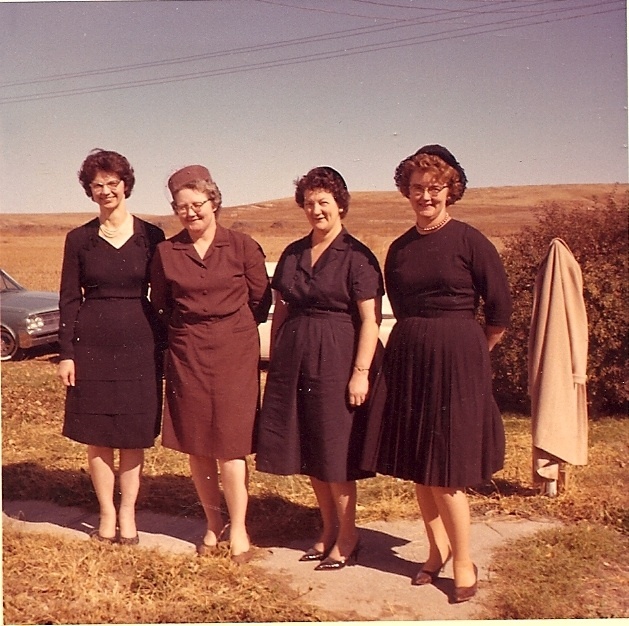 These are my aunts – the McTygue girls! Loretta, Anna Marie , Catherine and Patricia. This photo was taken in Eddyville Nebraska in my grandparents front yard. My grandparents lived on the edge of Eddyville and this was October of 1964. Eddyville was a small Irish settlement in Dawson County Nebraska. My grandfather had died on October 4th, and the family gathered to say goodbye! There are still two of the brothers and two of the sister-in-laws still living. Genealogy Volunteers for the Kansas City Irish Fest are the Greatest! 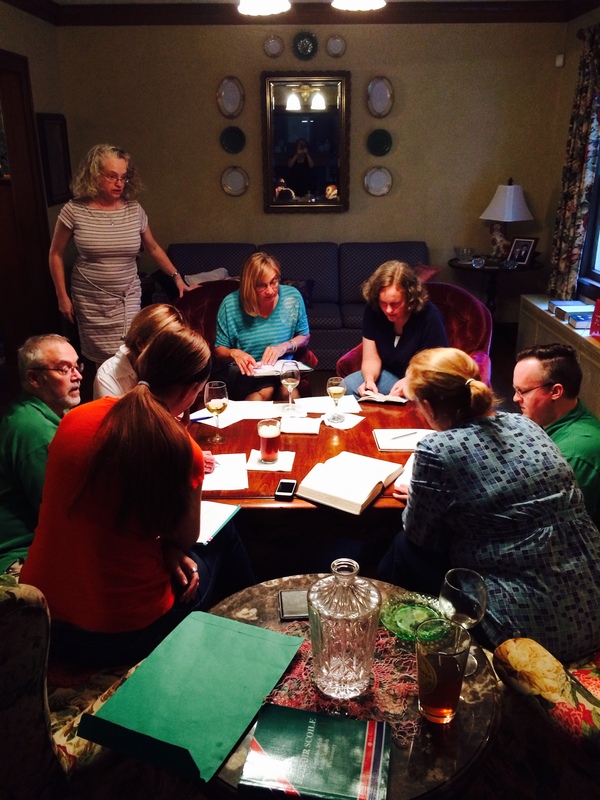 These are a few of the Genealogy volunteers for the 2014 Kansas City Irish Fest. The Kansas City Irish Fest is a celebration of all things Irish – music, dancing and heritage. 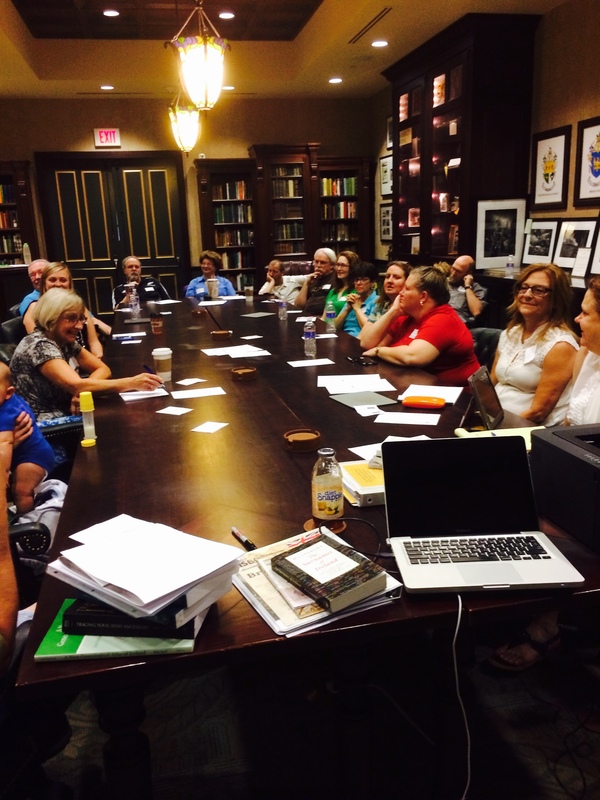 Today was ‘training’ for the Genealogy volunteers for the Kansas City Irish Fest! These wonderful people are volunteering this year. We have some ‘first year’ people and some who have volunteered every year! The stories that were shared were great! 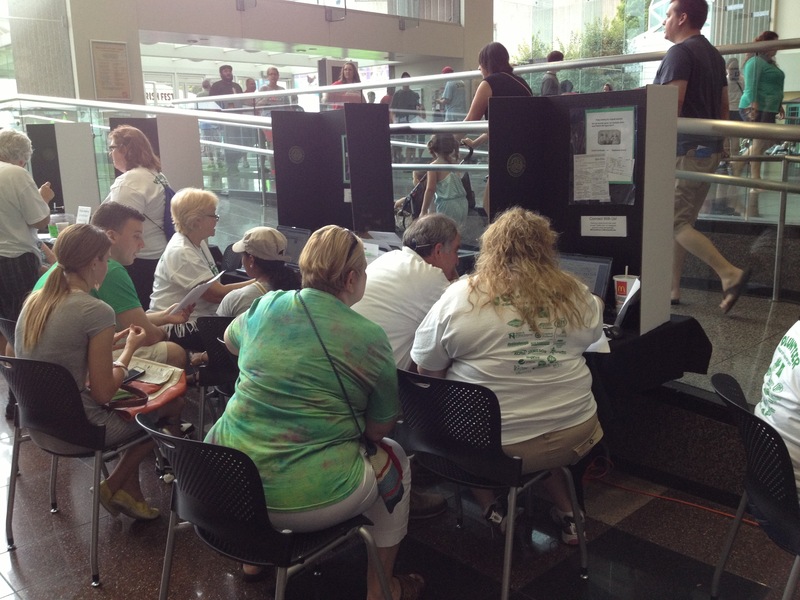 Please stop by Labor Day weekend – our genealogy area is located on the north side of the Crown Center Atrium. Looking for clues under every “leaf” on the family tree! 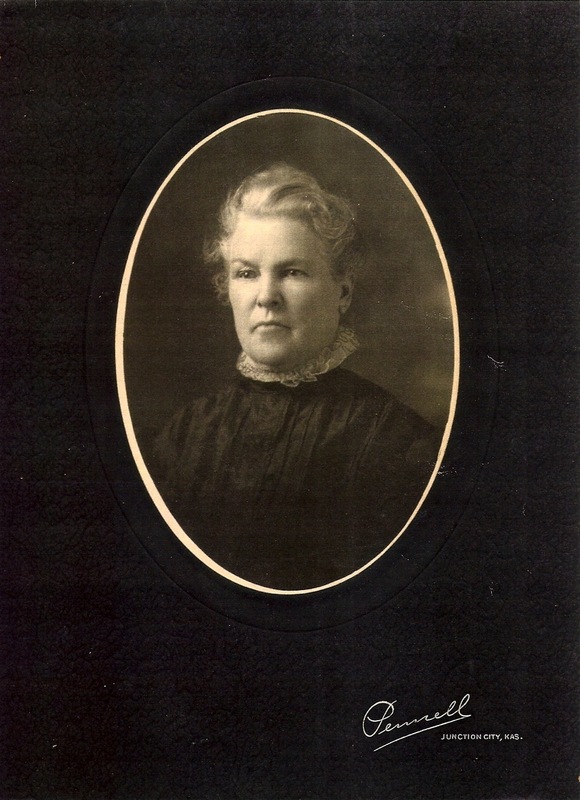 I hope some day to visit a cousin of mine, Margaret Conroy of Tryon, Nebraska and read a diary Grandmother Neville wrote. Margaret says she was born on Handsome Monday, but I rather think it was Hansel Monday (Consult large dictionary) However, she always said she was born in the same year Queen Victoria was. She was reputed to be a lady-in-wating in Queen Victoria’s Court. So you see my grandmother was a ‘Lady’. Someday I hope to know for sure. The morning my grandparents left Ireland, after Mass the priest, grandmother’s cousin, went to the ship with them when he bid my grandmother good-bye, he removed his cincture (evidently still dressed in cassock and surplice) and said his prayers went with it. I have the cincture in my possession now. While living in (perhaps) Wisconsin, she promised a neighbor woman to help her during her confinement. To get to her neighbors, she had to walk five miles cross country through a rather foreboding woods. The night before she was to go to the neighbors, she had a severe toothache that nothing would stop. But she couldn’t think of disappointing her neighbor, so she asked for her cousins prayers and rolling up a thread from his cincture put it into her hollow tooth. It stopped aching, and when she died at 87 years of age her teeth were all good but one. My father, five years old was left in Ireland. An heir to a factory (it was confiscated later) he had to stay in Ireland. At sixteen he came to American, but being away from his family so long he felt never became close to his brothers and sisters. I do not remember my father. He was killed by a train at Wahoo, Nebraska when I was about two and one-half years old. The story I enjoy the most was about his big-heartedness. One day an old Confederate soldier came up the road to our home and asked for a bite to eat. My father with this typical Irish graciousness said, “We will not only give you your dinner man, but as you look tired I would have you stay the night.” He, Barney Victory, stayed more than a years. My older brothers and sisters loved him. He later died at the Old Soldiers and Sailors’ Home at Grand Island of a heart attack while reading the obituary of my father’s death in the Wahoo Democrat. I should rewrite this but I am pressed for time and my arthritic wrist has “twinges in its hinges”. * John Neville was three when he parents left in Jan of 1850. * Rev. Peter Molloy was the priest from Rahan parish. Peter was born 1830 and died 1883. * I have not found any factory, but the cousins in Ireland thought John was left to secure their claim to the land in Lynally Glebe, Kings County (Offaly). * We are looking for Margaret Molloy Neville’s diary. A cousin in Arizona talked to a distant cousin that recalled reading Margaret’s diary. Having help with my family history! Translating an Irish song from pre-1834 about ‘faction fighting’! Last night I had help to translate a song from pre 1834 that has a connection to my husband’s family. 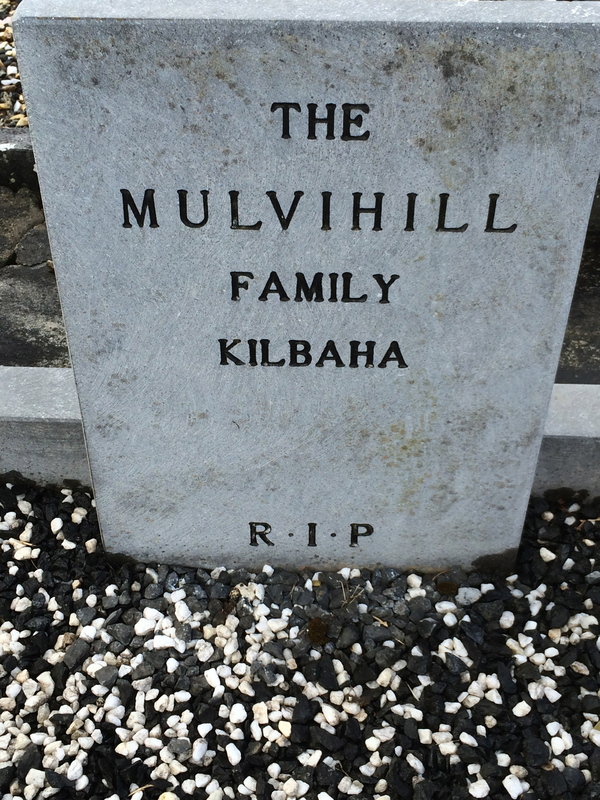 I had found the Mulvihill family in Kilbaha South County Kerry in Griffith’s Valuation. Timothy and his brother Miles Mulvihill lived there. I have also found their sister Honora Mulvihill who married John Lawlor also lived in Kilbhah South, a townland on the County Kerry and County Limerick border. Timothy Mulvihill moved to Kansas City between 1860 and 1870, he died here in 1872. I have found all 8 of his children were here in Kansas City Missouri. It is so exciting to find a document that tells a story about this family from the 1830’s! The song was taken down by Pádraig Feiritéar in Feb of 1895 from his brother Micil who learned it from their father. The problem is the song is written in Irish! And standardization of spelling in Ireland for names and place names did not happen until the 1920’s. Casadh giúistis cinn córum den chomharsain seo liom agus mé ag dul do súach abhaile. Do chuir sé stró orm agus b’eól do súd san agus d’iarr sé orm iasacht mo mhaide. Thanks everyone for all of the help translating! Do You Love Doing Genealogy? Volunteering at the Kansas City Irish Fest in the Genealogy area. Do you love doing genealogy? The Kansas City Irish Fest provides volunteers to help our patrons explore their Irish heritage. We need a few volunteers for the Saturday and Sunday afternoon shifts. Our area closes at 7PM – so there is time to go and enjoy the rest of the evening! What are your plans for Labor Day Weekend – Aug 29-31, 2014? * Fun! Serious levels of fun – helping people discover their Irish Roots! Did I mention that the genealogy are is the “coolest” area of the festival? Literally, we are located in the atrium of Crown Center shops. We have air conditioning! Last year we had people from 21 different states that came to find their Irish roots! This is serious FUN for everyone! I love to share my love of genealogy with others! Come share your love of genealogy! Contact me if you are interested. Or go to www.kcirishfest.com to volunteer! Fairy Tales vs Genealogy – why do some people make things up? I was getting a genealogy talk ready this week. I was preparing the slide show when I discovered there were a lot of trees on Ancestry.com with wrong information! I married into this family in 1970. My mother-in-law gave me 3 essays written in 1939 for the Bishop Thill essay contest by family members. These are on onion skin paper. I treasure these because these children interviewed their family members for this contest. 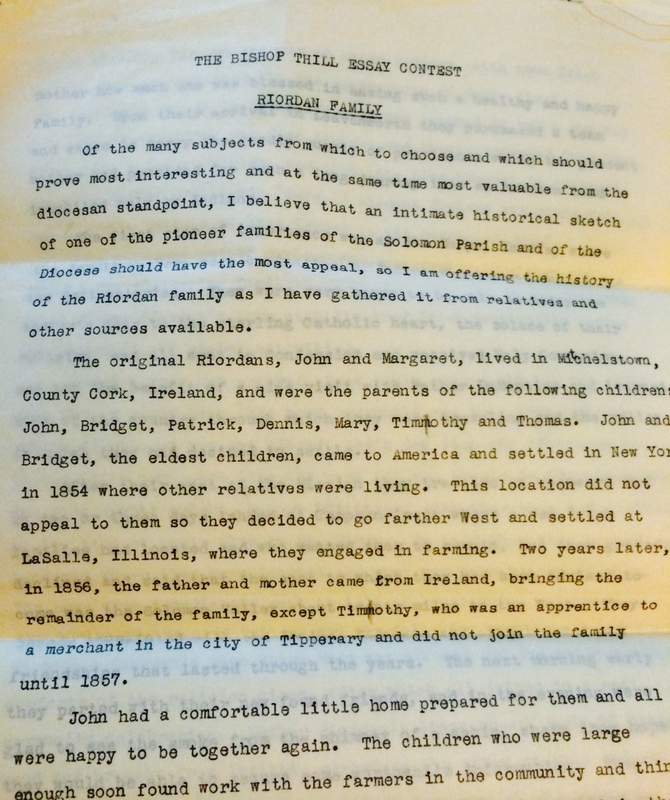 This essay is about the Margaret Sullivan and John Riordan family from Mitchelstown County Cork. I could not believe that people had added Simon as a father for John! If Simon was the father – and this being an Irish family every would have had a Simon (remember that Irish naming pattern?) This family does not have 1 Simon descendant! One tree even added 3 additional children for John & Margaret Riordan – 2 more boys named Patrick and a daughter Hannah – all born AFTER John died! John and Margaret had 7 children not 10! I retyped the whole essay and added it to my tree this morning. If you like to make up stories – that is fine with me, but don’t make up extra family members for a family. Haven’t they heard of documentation? I just returned from Ireland working hard in archives and libraries to add additional information. There is a place in the world for fairy tales – but save those for bedtime. What can you learn about your ancestors? Have you ever wished you could spend a day with one of your ancestors? I often wish I could sit down and ask them about how they lived, why they moved and what was their life like. My first visit to Ireland I learned about William Nevil/ Neville. Family oral tradition is that William moved from Mountmellick in Queens County to Tullamore to help build a castle. Mountmellick had been the home for the Nevill family from about 1700. 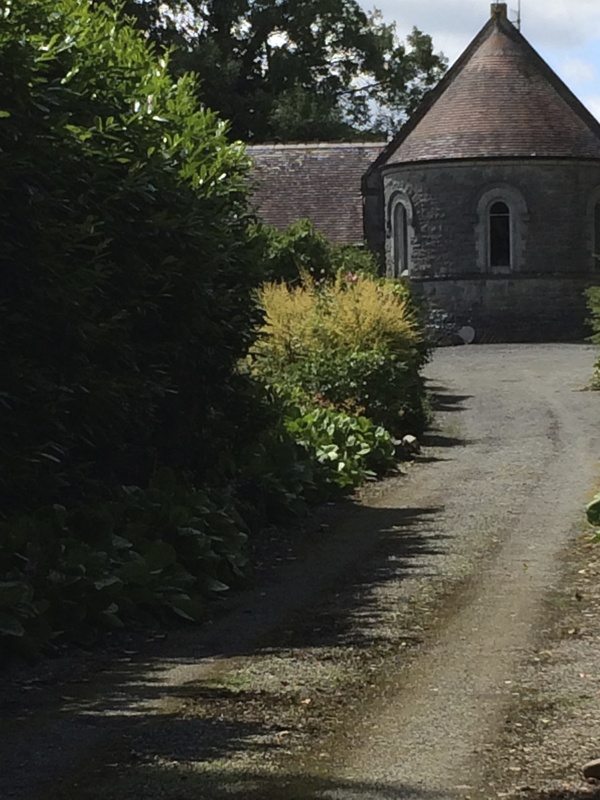 This summer I attended the Ancestral Connections Conference at UCC. On Wednesday afternoon Dr. Jane Lyons and John Nangle talked about cemeteries and headstones. John brought all the tools that they would have used. 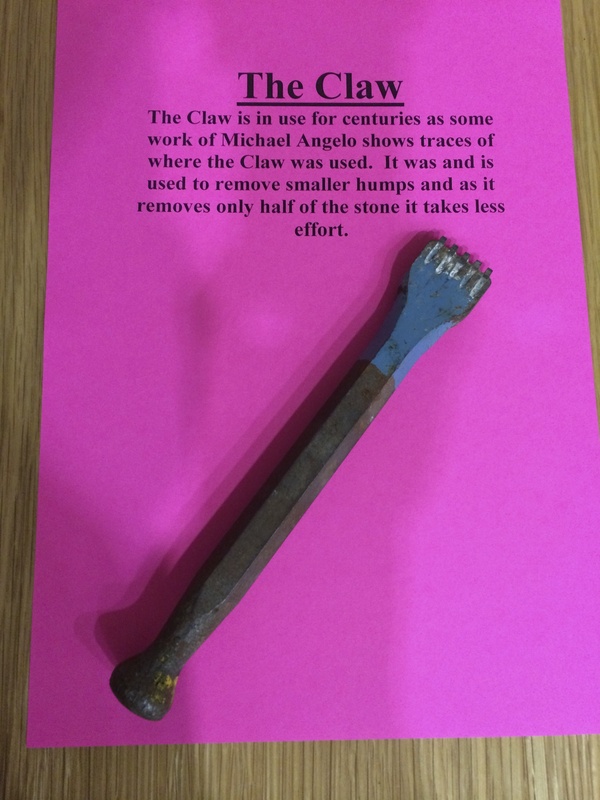 These are the same tools that a stone mason would use to build a castle. I took photos of all of the tools. 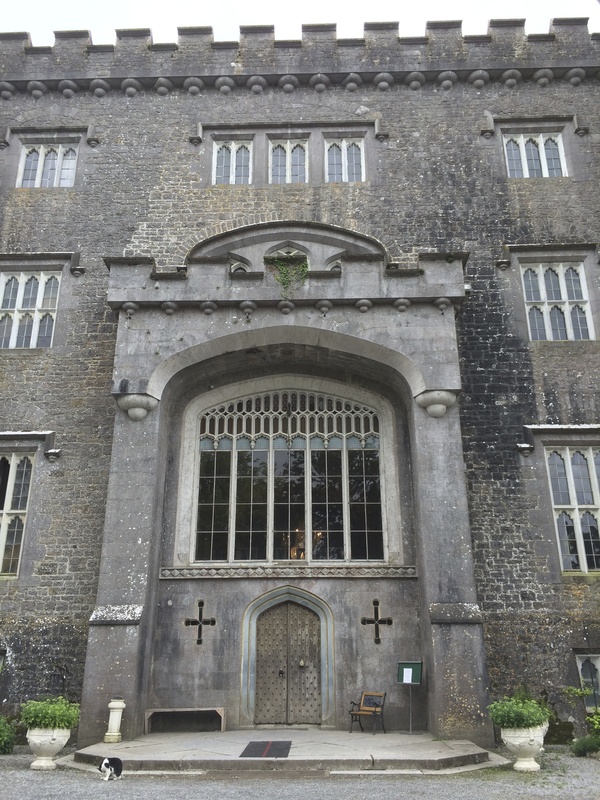 The next week when I was in Tullamore I visited Charleville Castle again. 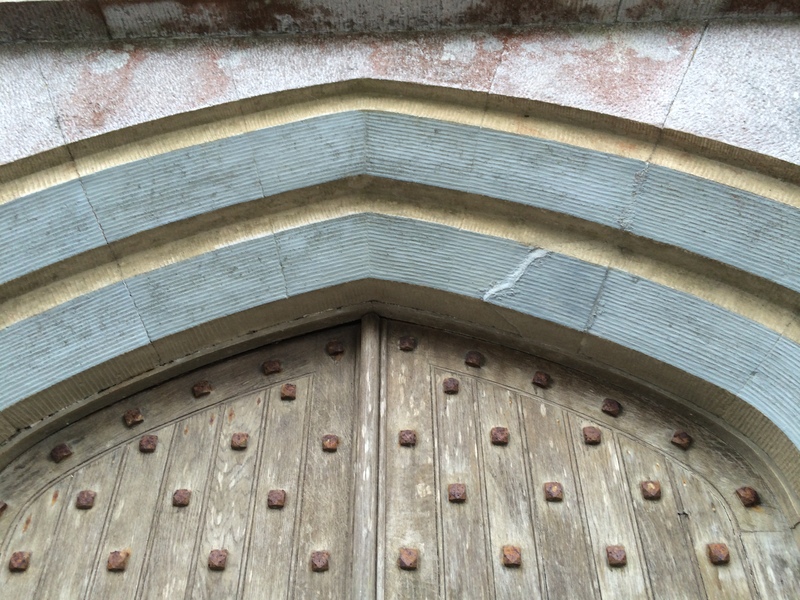 I really noticed the beautiful stone work around the large double doors. It would take a master craftsman to carve such delicate lines in stone – in 1800! “William, why did you move 14 miles from Mountmellick to Tullamore?” I can see in a 1802 church census you have a wife and four children – Jane, Joseph, Abraham & William. Building this castle would take a long time and you have a family to support. Neville – Nevel – Nevils – don’t worry about the spelling! This is the Lynally church that my Neville ancestors attended. Lynally Glebe is the townland in County Offaly (Kings) where my Neville ancestors moved to in 1799. I found the Aug 1802 census for this church. It is not a large Church, but the Lord Viscount and Lady Viscountess of Charleville also attended this church. William Nevils, wife, children Jane, Joseph, Abraham, William are my ancestors who were also members. – Of Catherine Egan, formerly of Tullamore parish of Lynnally, Kings county who came to America in 1844; located in Albany, NY; married Elijah Nevills of same parish and county, when last heard from was in Duncan Falls, Muskingham County Ohio. Information of her will be received by her brothers, Simeon and Patrick Egan, 102 Beeker Street, New York. Matt & I think this is another member of the family. When I returned home I took a long look at the naming pattern. This is what I found. The amazing thing is all three named their first son Joseph – The grandfather was William, why did they choose Joseph. Joseph was the oldest son for William and most likely Williams fathers name. Did something happen to the Joseph the oldest son of William? I don’t have any record of him. The other interesting thing I found was that Elijah and Catherine Nevel were in Albany New York, and where did Abraham and Margaret Nevils go to when then arrived in New York in 1850 – Albany New York! 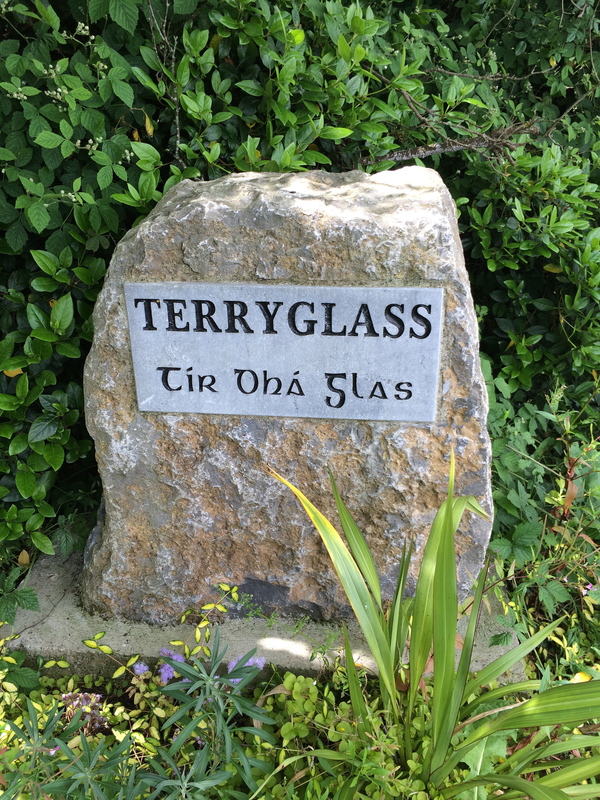 Visited Terryglass today….the home of Hannah Hogan the daughter of Michael and Hannah Hogan of Slevior County Tipperary. Michael and Hanna immigrated to Prescott Canada with their family. Their daughter Hannah married Thomas Hough/Howe after his wife died and left him with four small children. Hannah was born just outside of Terryglass in Slevior townland, County Tipperary. This is such beautiful country and has such a rich heritage. I would love to find more Hogan “twigs on the tree”! I have been in County Kerry working on the Mulvihill family! Found stories from 1808 and 1834 for the Mulvihill family from Kilbaha. They were known as the “Black Mulvihills”! I have identified two Mulvihill brothers each named their first son’s as Thomas. This is an great indication that the grandfather was Thomas Mulvihill. There are NO RECORDS for this time period! Kilbaha is on the Kerry/Limerick border! – Timothy’a brother was Miles Mulvihll and they had a sister who married a Lawlor! I will have info at the Kansas City Irish Fest if you are interested! What a great find this week in Ireland. Thanks to Ger Greaney!